Wild Bird Watching Equipment with bird watching binoculars, bird field guide books and Bird Watching Cameras is a great hobby. 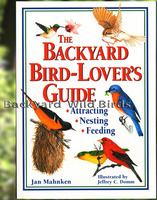 Bird watching videos and DVD's can help in bird identification and enhance knowledge of the wild birds all around us. BE SURE TO CLICK ON EACH PICTURE TO SEE ALL THE PRODUCTS IN EACH SUB-CATEGORY!